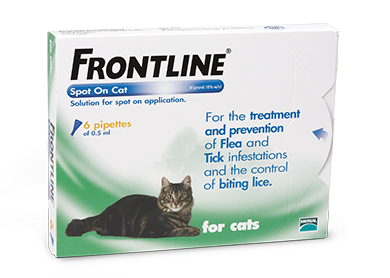 Frontline for Cats 6pack is for use in the treatment of fleas and the prevention of infestations by fleas and ticks or as part of a treatment strategy for Flea Allergy Dermatitis. 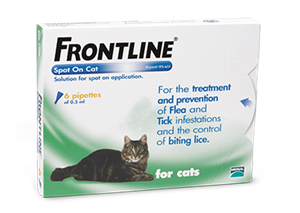 Frontline Spot On for Cats 3 pack can be used on kittens from 8 weeks of age. Dosage and administration: by topical application to the skin. Dosage 1 pipette of 0.5 ml per cat (approximately 7.5 - 15 mg/kg); follow the instructions on the packet for correct application. It is important to apply the dose to an area where the animal cannot lick off and to make sure that animals do not lick each other after treatment. Ensure that treated animals do not groom each other after treatment until dry. Frontline Spot On kills 98-100% of adult fleas on your pet within 24 hours of application. Frontline Spot On breaks the flea life cycle by effectively stopping the development of new fleas. Frontline for Cats is applied every 4-5 weeks whilst Frontline for Dogs is applied every 6-8 weeks. Frontline Spot On flea treatment works by direct contact with parasites after being applied to the back of your pets neck. Frontline Spot On active ingredient, fipronil, quickly dissolves into the natural oils of your pet’s skin and coat, dispersing over the entire body surface within 24 hours and concentrating in the skin's oil glands to form a reservoir. Apply Frontline Spot On by holding the pipette upright, snap off the top of the pipette along the scored lines, part the coat between the shoulder blades until the skin is visible, place the tip of the pipette on the skin and squeeze gently to empty its contents onto the skin, at one or two spots where the animal cannot lick it off. Frontline Spot On is manufactured in packets of 3 and 6 pipettes for cats, small dogs, medium dogs, large dogs and extra large dogs so as to ensure correct dosing for every size of pet. Each pipette once opened and placed on the skin at the top of the neck spreads the active ingredient over the skin to protect the whole animal from fleas. It takes about 24 hours for it to cover the whole body killing fleas wherever they are and remaining active on the body for many weeks. Virtually none of the active ingredient is absorbed into the body, making Frontline very safe to use though occasionally localised skin reactions may occur at the site of application. This is more commonly seen on cats than dogs and normally clears up without the need for treatment after a couple of weeks. Each application will protect you cat for about one month and your dog for about two months. Frontline (fipronil) is highly effective at killing fleas. Fleas which come into contact with the active ingredient will be dead within 24 hours and on application of frontline spot on reliably removes all fleas from your pet within two days. Do remember though that if you pets has had fleas for some time eggs will have been laid in your home which will be hatching out every day thus you will see some live fleas on your pet after the first two days. These newly hatched fleas will then die once on your pet. To shorten the length of time taken to clear all fleas from your house always use a household flea spray in combination with frontline application; do not forget either that you should treat all your pets and not just the ones you have seen fleas on.